Hands on Theater: Green Candle takes a new approach with "The Napoleon 2012"
One of the actors in “The Napoleon 2012,” John Oliver, walked into a rehearsal last week carrying a white bed sheet and talking cryptically about how “the sheet gag is better than the moustache gag.”On his heels, prop maker and painter Mike Smith strolled into the Off Center for the Dramatic Arts carrying an odd little statuette he said was built with a coconut for a head and a cat scratching post for a body, wrapped in rope. Its name? “Ropespierre,” a punny reference to Robespierre, one of the leaders of the French Revolution. A few feet away, actor Alex Dostie, cast as the Little Dictator himself, was being taken for a ride in a little red wagon. He disembarked, bypassed Smith and Townsend and greeted the newly-arrived figurine instead. “Ropespierre!” Dostie yelled as if he had known the coconut-topped Frenchman all his life. Sheet gags, rope-bound revolutionaries and Napoleon in a Radio Flyer give ample visual evidence that “The Napoleon 2012,” a satirical play within a play that debuts with two sold-out performances Saturday, is no ordinary production. Behind the scenes, though, the work that marks the 20th anniversary of the Green Candle Theatre Company is even more unconventional. 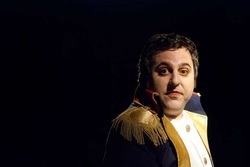 Aaron Masi conceived “The Napoleon 2012” as a project he calls “hyper-integration,” with local theater people taking on duties they don’t normally do. A costume designer might be called upon to act, for instance, or an actor could be asked to build sets. “It’s not normal. Normally you become a lighting designer, you become an actor,” Masi, whose previous works include the 2008 Green Candle production “The Nose,” said in a conversation just before rehearsal last Wednesday night. By asking people to do things outside of their comfort zones, Masi believes actors and crew members will not only learn a new skill, they’ll have a better sense of how all elements of a production fit together. An actor learning about props, for example, might have a suggestion for a prop change that could make his or her performance more effective. Because of that, “The Napoleon 2012” isn’t quite the hyper-integrated production Masi envisioned. The open process of creating the production meant February arrived and Masi was still trying to figure out exactly who would be doing what, so he said the company had to dial back on hyper-integration. “That process where everybody was involved continued on,” however, according to Masi. He found that no one wanted to do the dirty work for a small theater company, namely fundraising. He initially hoped for a $30,000 budget for “The Napoleon 2012” but dropped that to $10,000. He also cut the length of the play’s run from 15 weeks to 12 to the final number, six. “It’s twice as long as we’ve ever done a show before” at Green Candle, Masi noted. Masi, who teaches at an alternative school, wants to do theater for a living, and the larger budgets and longer runs are part of that goal. The sense of togetherness Masi wants to create with his hyper-integration model appears to foster loose, easy-going rehearsals, if last Wednesday’s session is any indication. Dostie, as Napoleon, and Aaron Reil, cast as the Duke of Wellington, re-enacted the pivotal Battle of Waterloo on a floor painted with a colorful map of key locations in Napoleon’s career of conquest. In this case, the battle was fought not with guns but as an exaggerated boxing match, with the occasional play-by-play commentary from the sidelines (“The emperor strikes back!” Oliver yells). The assembled cast and crew laughed throughout and applauded when the two pugilists were done. Looseness is great for creating a team atmosphere in a production, but hard work will make the play a success. One of the play’s actresses says the idea that everyone contributes to the creation of “The Napoleon 2012” gives each participant that much more ownership. MacPhail helped shape her character as the script was being created. She was interested in the idea Napoleon may not have loved Marie Louise but saw her mainly as a tool to provide him with an heir, while Marie Louise looked at it as simply doing what her duty commanded her to. “That sort of injustice was woven into the script,” according to MacPhail. That’s just what Masi was hoping for when he came up with the concept for “The Napoleon 2012.” He wants crew members to pick up new skills and actors to be involved in writing plays and “having your character say things that are important to you.